We tend to think of petrol stations as bleak, transitory spaces; they’re unsightly but essential and eerily homogeneous, all with the same sensory assault of odours and fluorescent strip lighting. But Gestalten’s It’s a Gas! The Allure of the Gas Station reconsiders these roadside fixtures, reminding us of their diversity as worldwide objects of architectural and cultural curiosity. 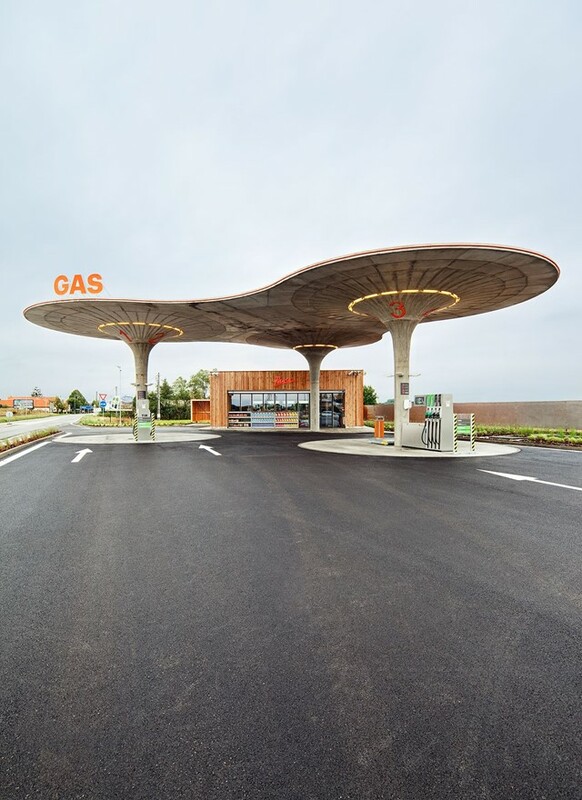 From their first appearance in the late 1900s to the hyper-modern contemporary structures, the anthology illustrates how all the prominent movements in 20th- and 21st-century architecture and design have been represented in the history of the humble gas station; It’s a Gas! reframes these underappreciated buildings as fascinating features of the machine age – emblems of adventure and harbingers of cultural change. The road trip has a unique cultural currency in the US – as a rite of passage, a grand narrative. 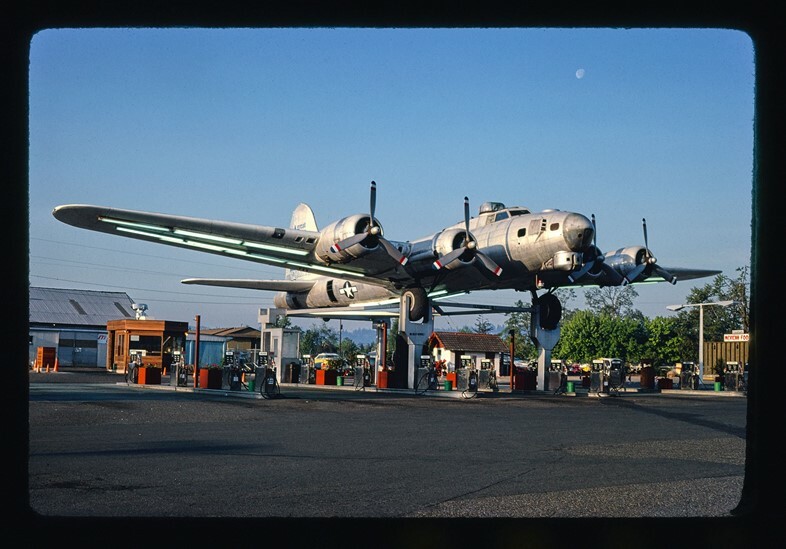 Accordingly, American filling stations have always possessed a kind of special status, but the rise of interstate journeys and the burgeoning materialism of the 1950s ushered in their ‘golden age’. “Some gas stations matched the extravagance of the cars at the time, with their canopies spreading like wings, just like the fins on a late-50s Cadillac,” talk show host Jay Leno reminisces in the book’s introduction. What appears outrageously kitsch now was once state of the art, for those who pulled in to refuel at these ‘temples of mobility’. The lavish, space-age gas stations depicted in It’s a Gas! serve as barometers of 1950s America’s confidence, in both itself and its ongoing prosperity; they are visions of what the future looked like from the vantage point of an affluent decade. New Wave European service station kiosks were much more reserved than their outlandish American counterparts. 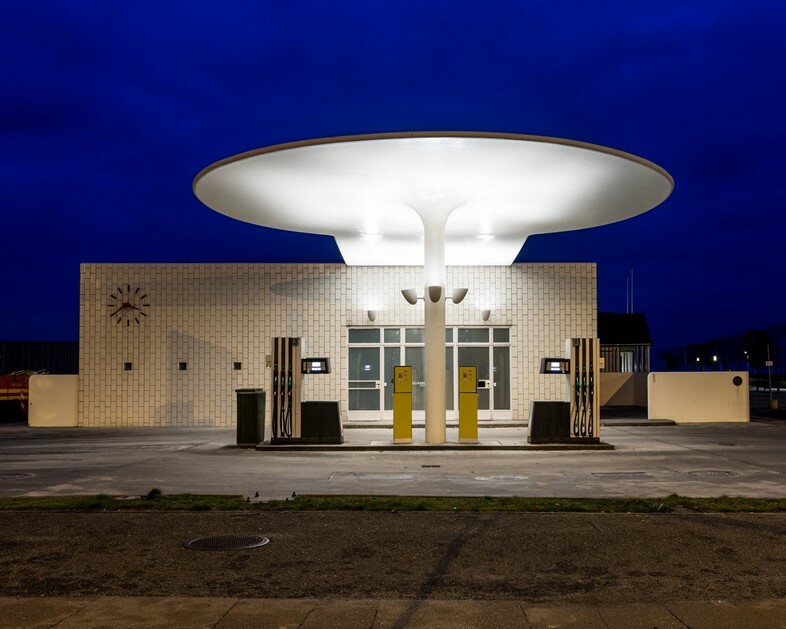 Skovshoved gas station, on the outskirts of Copenhagen, was built in 1936 and designed by pioneering furniture architect Arne Jacobsen; it’s a functionalist masterpiece of clean lines, light and space, comprising a white tiled façade and an elliptical canopy. The plan was to roll out this design across all Texaco stations in Denmark, but this phase was never undertaken, and Skovshoved remains a one-of-a-kind prototype for an unrealised scheme. 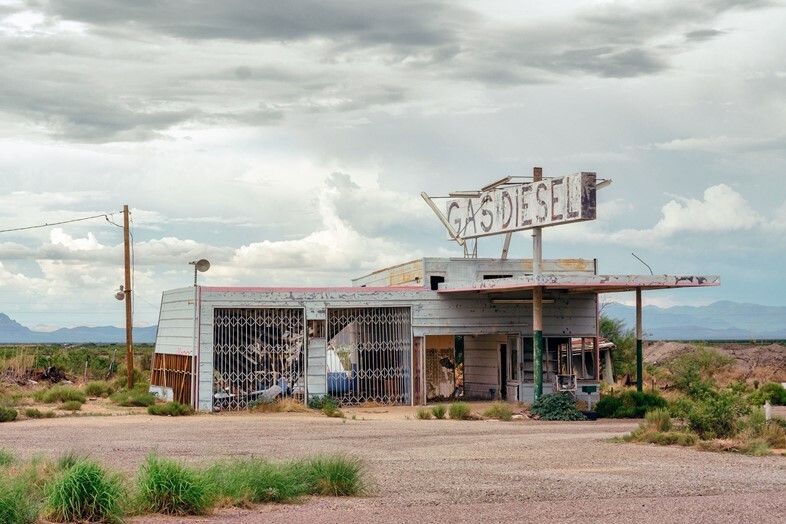 There’s a romance to the ‘ghost town’ abandoned gas stations of the last chapter – these redundant, disused buildings possess a kind of cinematic glamour. 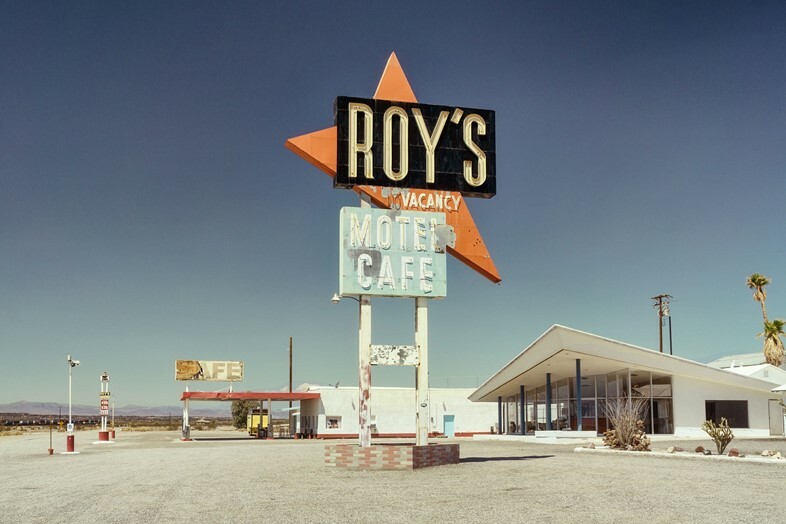 Run-down stations on Route 66, for example, give an impression of what the historic road was once like, when driving was the preferred means of travelling from one side of the country to the other. 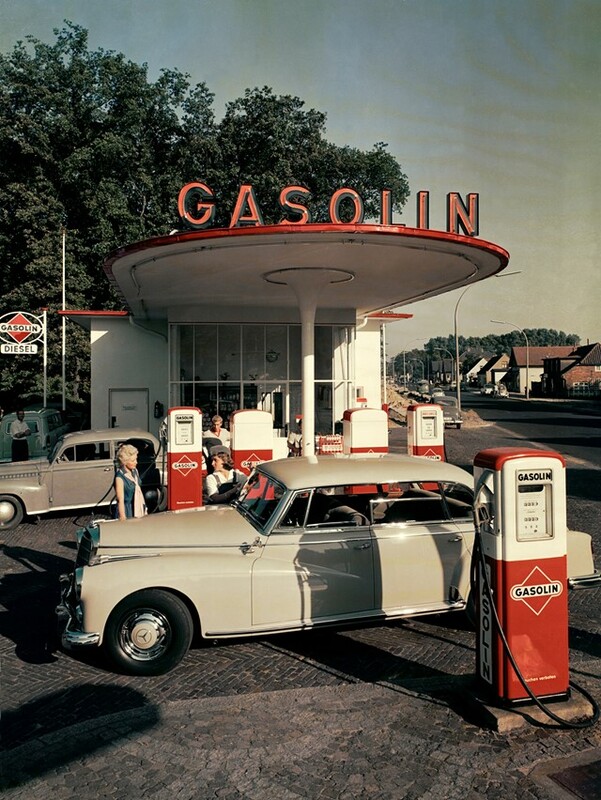 But these images are as prescient as they are nostalgic; in the future, when electric cars rule the roads, petrol stations may not exist as we know them today. Perhaps then we’ll look back at the modern-day petrol station, depressing as it is, with the same fondness and sentimentality as we feel when we leaf through these pages. It’s a Gas! The Allure of the Gas Station is out now, published by Gestalten.